Footage has emerged of bounty hunters apparently seizing the wrong man, forcibly taking him out of his home and ‘kidnapping’ him, all because he had the same name as the person they were after. The incident took place on December 29, at around 7pm, in Virginia, USA. 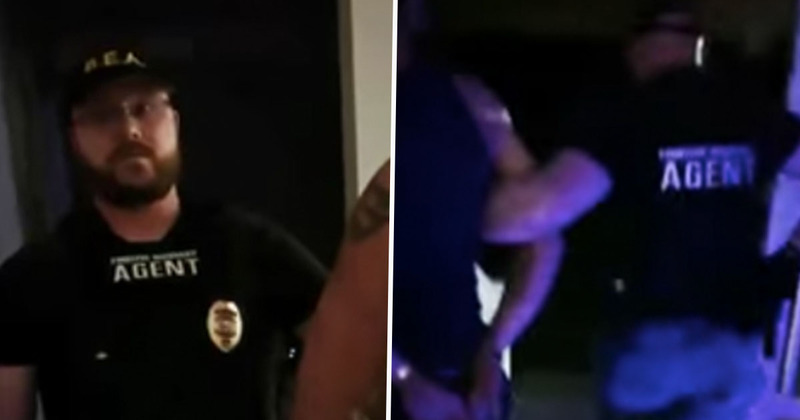 The video shows a number of men, reportedly from the Henshman Bail Enforcement Agency, of Fredricksburg, Virginia, forcibly remove a man named Neil S. Jr from his home. The video also shows a photo of the Neil S. the enforcement agents were allegedly looking for, who was wanted for skipping bail. VA Bail Enforcement agents came to the door with weapons drawn Threatening to kick it in as 15 year old girl opens door. Henshman Bail enforcement of VA proceed to (with use of unnecessary force) abduct a man with the same name as the skip. Prince William County PD refused to come help when 911 was called. The agent drove the man around for an hour before dropping him off at home. Prince William Police refuse to press charges on the agents. Check out the video, so you can be the the judge. I couldn’t imagine how pissed I would be if this was me. The video of the incident, apparently filmed by the man’s wife, shows her pleading with the agents and repeatedly telling them they’ve got the wrong man, as well as calling the police. The woman behind the camera can be heard asking the agents to provide a date of birth for the man they’re looking for. The man is then taken out of his home before he can even put his shoes on, and put in the back of the agents’ car. The agent also says the man, Neil, has been arrested before. Though the man they are putting in the car tries to tell them he has never been arrested in the past. Towards the end of the video, the apparently wrongly seized Neil can be seen at the Prince William police station, wanting to give a police report about his ‘kidnapping’, though seemingly being told that he couldn’t, and that the police would not be pursuing any charges against the bail enforcement agents.